Ireland, 2004, 83 minutes, Colour. Tom Murphy, Mark O’ Halloran. The Irish are prolific users of what has been called the ‘multi-purpose’ f word. We might remember it from The Commitments and more recent stories of terrorism. It is a dialogue staple of Adam and Paul. It starts as one of those offbeat comedies with two seemingly hopeless junkies wake up and wander Dublin, getting into trouble, seeing their mates, looking for a score and generally messing up. But, after a while, thoughts of Samuel Becket and Waiting for Godot, tramps and existential conversation, come to mind and we begin to respond to the underlying humour and humanity of this very odd couple. Mark O’ Halloran, the writer (who also acts as the taller tramp – we don’t know who is who as everyone greets them as Adam and Paul) says he also had Laurel and Hardy in mind as a model for the interdependence and the comic routines. Because of the picaresque adventures that are one minute warmly laughable and the next moment disconcerting (just as we begin to like them, they harass and rob and nice Downes syndrome young man at a bus stop). This is a contemporary Irish yarn of the homeless and the druggies, the cons and the pubs – a comic-serious reflection on ‘Such is Life’ with a touch of blarney. 1. A popular Irish film? Yet an oddball impression of Ireland and Dublin? Irish lifestyle? The 21st century and drugs? Irish humour, comic personalities? The serious aspects? Audience sympathies? The overall impact – and the film winning many awards? 2. The tradition of Samuel Beckett, his theatre, Waiting for Godot? The film-makers acknowledging their debt to Lauren and Hardy? The juxtaposition of events for comic and serious effect? 3. The Dublin settings, the streets, the houses, the police stations, flats? The structure of the day in Dublin? The landscapes, the fringe of Dublin? The working-class areas? Non-working-class areas? The drug world? The musical score? 4. The title, the focus on Adam, on Paul, their relationship, dependency? 5. 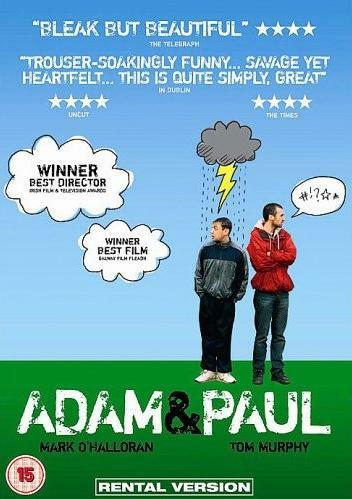 The day and the events, Adam and Paul as homeless? Intelligent or not, using their wits? Nice or not – and the audience unable to anticipate their behaviour, humour, seeming friendly, and then exploiting people? The drug world – and the possibilities of death? 6. The cumulative effect of all the incidents, the coat and the mattress, the shop and the bread, the milk and the Bulgarian, Martin and the drugs, the beggar, the injuries, the excrement, the episode with the baby and Janine, the baby and responsibilities, care for the baby? The Downs Syndrome boy, the brutality? Robbing him? The issue of the television, finding it, stealing it, breaking it? The inefficient robberies? The bunker, the mother? The cigarettes and being sent off? The drugs and the fall, the night, death? The end and cigarettes? The overall impact? 7. The characters of Adam and Paul, their age, experience, not having their background, their friendship, Janine, issues of drugs, death, smart or not, who was the leader, the language and reactions to their language, their hurting people, ability to survive or not? Issues of luck? 8. The portrait of the Bulgarian, his being in Ireland, the background, issues of migrants and the European Union and Ireland’s place? The milk? 9. The character of Janine, the baby, relationships, the dangers with the baby? 10. The drugs, the drug dealers, the prevalence of drugs in Dublin, the drug culture? 11. Stealing, fencing goods, the television, the humour of going to the room to get the television, getting it down the steps, transporting it, the man fencing it – and the breaking? 12. The background gallery of characters, Clink, the beggars, people in the pub, the other addicts? 13. An entertaining experience – wry humour, Irish humour, social comment and critique through satire?